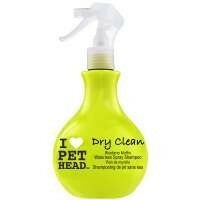 Pet Head Dry Clean Waterless Spray Shampoo 450ml. Get fresh in a flash! This spray on non rinsing shampoo cleanses your pets coat without water. Also perfect for trips or just a quick freshen between baths. Directions for use: Spray liberally onto dry coat. Avoid eyes and ears. Dry with towel and brush coat for a clean fresh coat. This product is an absolute lifesaver. My dog often comes back muddy from walks and it's a great way of cleaning her fur without having to bathe her properly.